SPECIAL APPLICATIONS - COGSWELL SPRINKLER CO. In order to address the ever evolving challenges in the fire protection arena, The Cogswell Companies have ventured beyond convention and adopted new and forward thinking technologies. Cogswell is pleased to announce the addition of such ventures to their already diverse resume of firefighting capabilities. 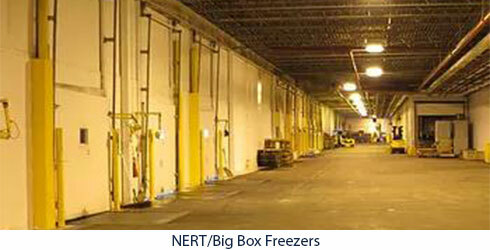 As a Quell licensee in the New England states, Cogswell is positioned to offer the "Big Box Freezer" Industry an alternative to the problems formerly associated with freezers and fire sprinklers. Tyco Fire Products (TFP) has recently introduced a remedy for builders and owners of large food storage freezer facilities. As a dedicated user of Tyco equipment, Cogswell is uniquely positioned to install the Quell System. In order to meet strict deadlines set forth on current construction projects the Trimble RPT600 can be an indispensable tool. Through detailed 3D coordination, hanger locations can be loaded into the machine and located automatically. By marking the hanger locations as the Trimble directs the user, measuring is taken out of the equation. On concrete buildings hanging devices can be preset before the concrete is poured to eliminate drilling and greatly increase productivity.